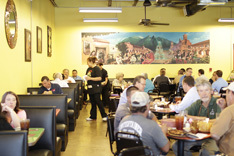 Nearly four decades after Amelia Herrera founded the first Herrera’s on Maple Avenue, this Mecca of Tex-Mex continues to serve the same No. 10 (one tostada with guacamole, one cheese enchilada, and a soft cheese taco) and No. 2B (two enchiladas smothered with chili con queso, rice, and beans) that earned it a rock-solid reputation all those years ago. It recently relocated a few doors down.